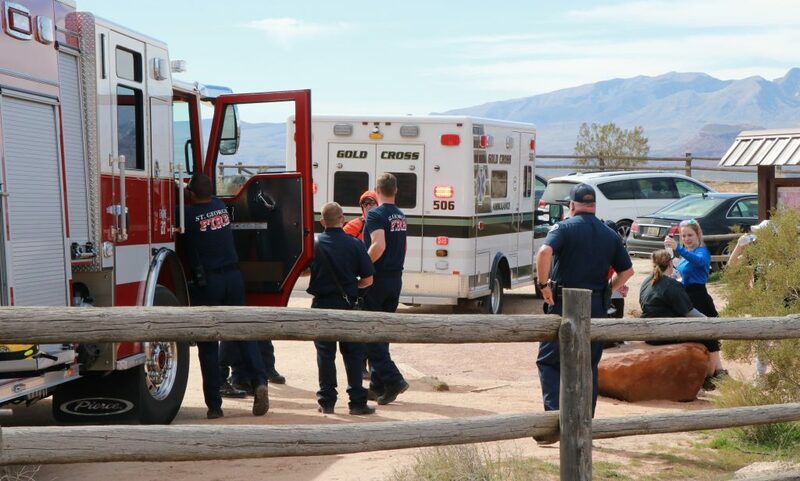 ST. GEORGE — A rock climber was injured Monday afternoon in a fall near the Chuckwalla Trailhead. Capt. Dan Cazier of St. George Fire Department said emergency responders were called to the area shortly after 2 p.m., on a report that a man, estimated to be in his early 30s, had fallen approximately 25 to 30 feet while climbing the face of a rock wall with a group of fellow climbers. The sandstone formation, known as the Chuckwalla Wall, is a popular climbing spot. “He’s being transported to the hospital for his injuries,” Cazier said, adding that the man’s injuries did not appear to be life threatening. Cazier offered a few safety reminders for would-be hikers and climbers. “It’s getting warm, and people want to be out and recreating,” he said, reminding climbers to wear helmets and have proper equipment. “Also, plenty of water. It’s getting warm out here. We attended to some hikers while we were down there who had run out of water,” Cazier added.